Canberra, 1972, and the Pest Control Team at the Department of the Interior is locked in an epic battle against an often concealed enemy lurking in the murky depths of our waterways, and multiplying at speed. It threatens the delicate local ecology, and plays havoc with our recreational water activities. 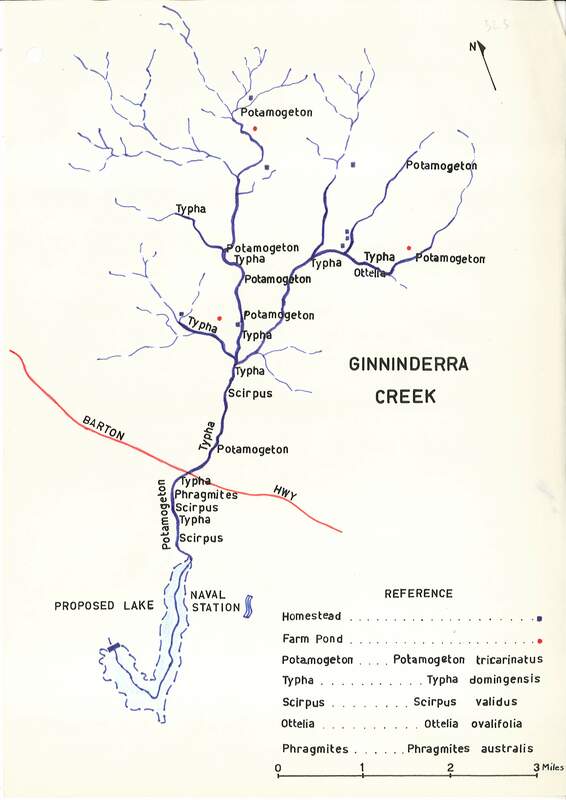 Aquatic weeds were winning the war, and with the development of Lake Ginninderra looming a new weapon was needed to turn back the tide. Aquatic weeds were originally present in every major river flowing into the ACT, making eradication impossible. 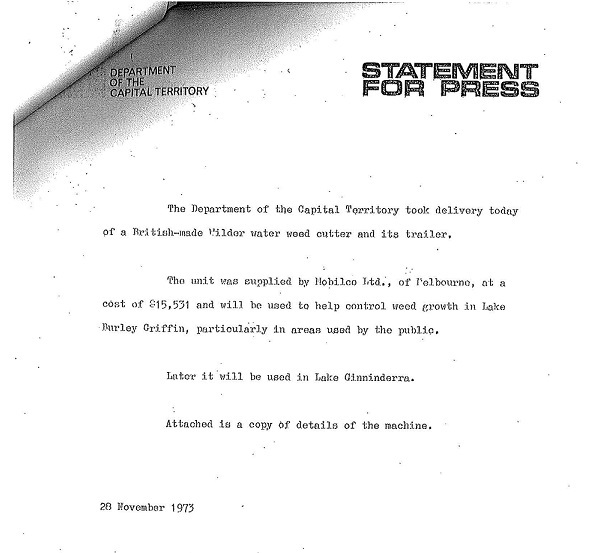 With the formation of Lake Burley Griffin in 1963, control measures were put in place that included a mixture of observation, chemical warfare and manual labour. As we head into the hot summer months Canberrans will be looking forward to swimming, fishing and boating in our lakes and rivers. Unfortunately, summer often brings blooms of toxic blue-green algae that sometimes close our beautiful lakes. Weed control has been an issue for the managers of Canberra’s public places ever since Lake Burley Griffin was established. 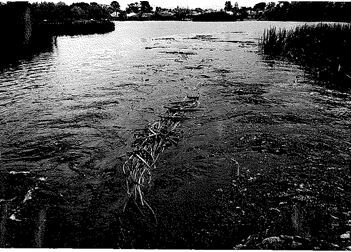 The search for a solution to the water weed management problem in the 1970s is our January Find of the Month. 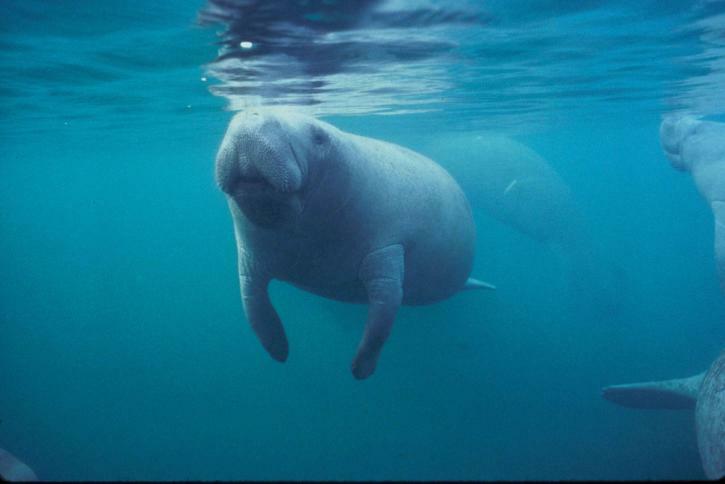 Aquatic plants play a vital role in the freshwater ecosystem by providing a safe habitat for small creatures and young fish, slowing erosion by protecting shorelines, improving water clarity, providing a food source for birdlife and more. So what makes an aquatic plant a weed? Essentially it all comes down to how fast they grow and how wide they spread. Some aquatic weeds are even capable of spreading through pieces that are carried by birds to new waterways. In the 1960s the standard treatment for the control of aquatic weeds was to monitor their spread and use chemical treatments as necessary. The public was notified through advertisements in The Canberra Times when treatment was taking place. Notifications included the date and time of the treatment and the period that the area should be avoided. The weedicide of choice at this time was Acrolein (brand name Aqualin), and by 1965 a regular spring/autumn treatment was under consideration. Acrolein was highly effective and quick to disperse, leaving no visible trace after 24 hours and leaving root systems intact to help curb erosion. It did have some serious disadvantages however: it was highly flammable, expensive to import and toxic to fish. In today’s more environmentally aware world, it is hard to imagine that a chemical that was toxic to fish would be used to control aquatic weeds. In theory the chemical was to be released slowly into weeded areas which would allow time for the majority of fish to escape. In practice, this was not always the case. Issues were reported regarding the quantity of dead fish post weed treatment, particularly in regards to young carp which often inhabited the high weed areas. Local fishing experts also raised their concern at the effect of spraying on other species including the diminishing stock of yabbies, which were an important food source for native fish species, and were also caught for human consumption. To be fair, Acrolein was at the time the safest choice for animals and people. Carp were themselves considered a pest and the loss of young carp most likely led to a better environment for other native fish. In 1971 government records note, though, that the use of Acrolein was not a long term choice. As planning commenced for Lake Ginninderra a survey of Ginninderra Creek confirmed that, although a preventative program using ‘very potent, highly residual weedicides’ would eradicate potential weeds, this approach was impractical given the risk of chemical residue, wide scope of the task, and the cost of the high volume of chemicals required. The time was right to find a new long term solution. Of particular interest was the Asian grass carp (Ctenopharyngodon idella). Pond-fish culture was well established in Asian countries and many, including China, Japan, Indonesia and Malaysia, were partaking in this practice as an alternative to chemical weed control. Canada, the United Kingdom and New Zealand were also considering the grass carp to control weeds. Unlike the ornamental carp that were accidentally introduced into our waterways, the grass carp were unlikely to breed (leaving a better environment for native fish), were considered more edible, and would offer a challenging catch for fisherman. Unfortunately importation of the fish, even for experimental purposes, was forbidden in Australia at this time. In 1966 a New Zealander by the name of Powell invented a prototype for an underwater mower which he then took to England for further development. The basic idea of a mower attached to a fiberglass hull was adapted by the John Wilder Engineering Company into the Wilder Water Weed Cutter. In 1973 the Technical Officer for the newly created Department of the Capital Territory began researching the effectiveness of a mechanical aquatic weed vehicle. Weed cutting boats offered several advantages: they were able to run at anytime of the year, were environmentally friendly, didn’t interfere with recreational activities and were comparatively inexpensive. The disadvantages were that the cut plants still needed to be gathered and disposed of, freed vegetation could potentially spread and colonise otherwise weed free areas, and they had a limited effect on submerged weeds. As weed cutting boats were quite intricate, the department ruled out developing its own prototype, and started looking for a commercial option. In 1973 the only commercially available vehicle in Australia was the Wilder, which was already in action on the Nepean River, on the water supply at Mt Isa and in South Australia. A second unit called the Barracuda was also available in England, but as no sales had been made in Australia, it was difficult to make a fair assessment. When the Penrith City Engineer was contacted for feedback he indicated that while there were some initial problems with submerged reeds, the manufacturer was quick to fix this and overall he was extremely happy with the results. Based on his positive feedback, technical staff then attended testing of a Wilder at Lake Wendouree in Ballarat . 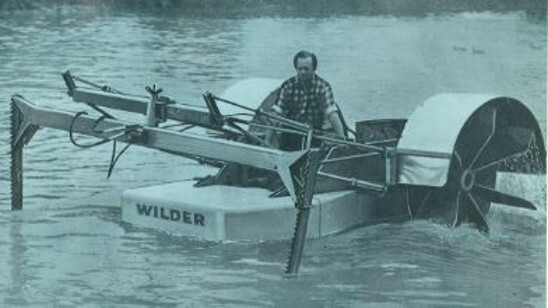 After a rigorous tender process, the Wilder water weed cutter was purchased and delivered on the 19th of December 1973. The Wilder was used well into the 1980s and its introduction meant a significant decrease to chemical treatments in our waterways, allowing greater recreational use and a balanced approach to aquatic weed control. Archives ACT would like to thank Sam Neylon, Transport Canberra and City Services and Peter Beutel, National Capital Authority for their support in researching this FOTM. If you would like to learn more about aquatic plants and the control of weeds in our waterways please contact ArchivesACT through our “Request a Record” service. If you would like to view the original documents you can also contact us to arrange a suitable time to visit the Archives ACT Reading Room located on the top floor of the Woden Library. Please note that the Reading Room is closed over the Christmas Period and will reopen on 9 January 2017.